Against his better judgment, Captain Craig Taylor has accepted command of the new corporate class sales cruiser VENTURE PROBE, an exorbitantly incapable ship designed and built by the PEBKAC Corporation; a shameless bureaucracy. With the help of his crew of incompetent but amiable corporate shills and a cargo deck filled with soulless sales clones, Taylor embarks on a mission to penetrate the newly liberated (and possibly still smoldering) regions of the galaxy and sell photocopiers. So it’s bureaucracy ahoy, space administrator! Make sure your “superior officer accountability waiver” is signed and filled out in triplicate and get ready for some pure, unbridled space panic! 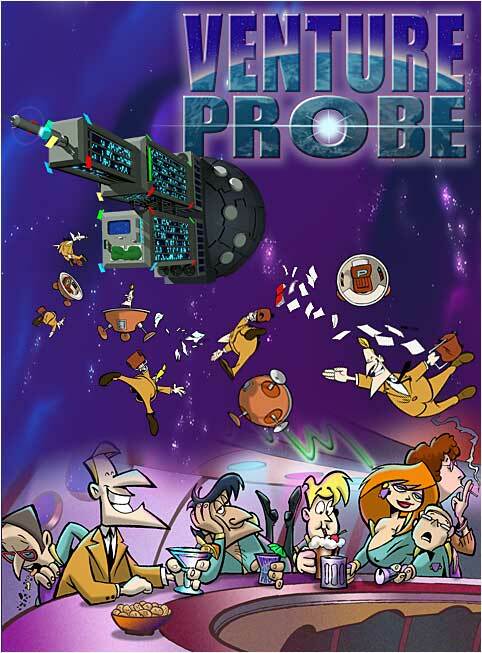 VENTURE PROBE was created and written by Robert Hughes and Joseph Walker, designed by Antoine Guilbaud and art directed by Mitch Schauer.